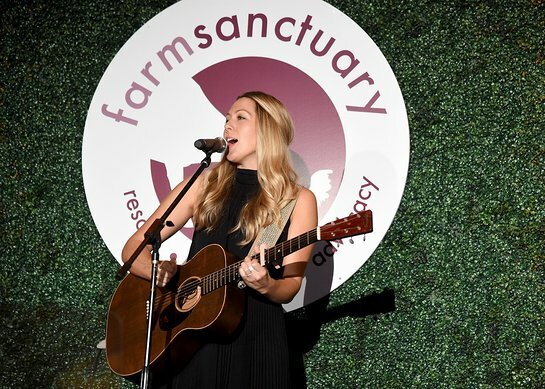 Farm Sanctuary, the organization dedicated to combating the abuses of factory farming and encouraging a new awareness and understanding about farm animals last night hosted their 2018 Gala “Farm Sanctuary On the Hudson” in New York City. The event, hosted by Bellamy Young honored Carol Leifer, Tracye McQuirter and Dr. Kristi Funk. Special guest presenters include: Emily Deschanel, Sandra Lee, Michael C. Hall and Cyndi Lauper. Additional guests in attendance included Gene Baur (President, Farm Sanctuary), President Eric Adams(Brooklyn Borough President), Jennifer Coolidge, Joan Jett, Joe Gatto (Impractical Jokers), Willow Hand (model), and Loretta Swit. The evening featured music by Colbie Caillat and DJ Valida. Founded in 1986, Farm Sanctuary works to change how our society views and treats farm animals through rescue, education and advocacy. The organization provides lifelong care for animals rescued from abuse at sanctuary locations in New York and California; promotes compassionate vegan living; and advocates for legal and policy reforms. To learn more about Farm Sanctuary, visit farmsanctuary.org.